Ranking well in the search engines is crucial if you want your website to be truly successful (and who doesn’t?!) But improving your WordPress website’s SEO isn’t easy. And with thousands of articles and tutorials written on the subject, it can often be hard to know what advice to listen too and where to start. The rule of thumb with web hosting is that you get what you pay for. Do your research when choosing a web host and don’t just pick the cheapest package you can find. SiteGround is an impressive hosting provider, that offers very reasonably priced hosting plans, WordPress specific hosting, and servers powered for high website performance. A hosting service like this, that is fast and reliable, can make a real difference to the experience your users receive on your site, and consequently where your site ranks in Google. You can also read my SiteGround review. Install a Cache Plugin – WP Super Cache is an effective free WordPress plugin that will cache your content and serve it up quickly to your site’s visitors. Optimize your Images – Imagify is an affordable WordPress plugin that will resize and optimize your images to help prevent them from slowing down your site. For more top tips on improving site loading times, check out our article How to Speed up Your Blog. Google has recently made it clear that it will penalize any sites that are not mobile friendly. Therefore, if you are using an old WordPress theme, then it may be the time for an update. Modern WordPress themes are not only optimized for the search engines, but they are also mobile responsive and retina friendly. This will help ensure your website looks great whatever device it is accessed on. New WordPress themes can be downloaded for free from the WordPress Repository, or purchased from reputable theme shops like ThemeForest. If you aren’t ready to part with your old theme yet don’t worry. Jetpack has created a Mobile Theme module, which will enable you to create a mobile-friendly version of your current theme. 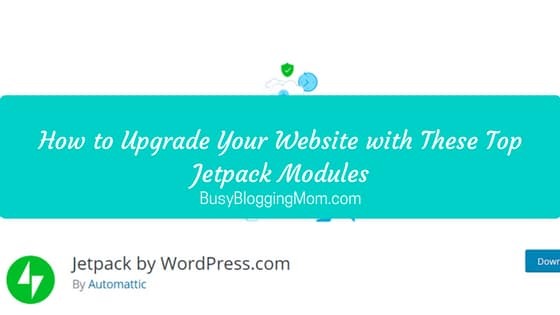 Quick and easy to install and activate, the Jetpack Mobile Theme is a great free option that will help improve an old theme’s SEO. Google rewards websites that are constantly updated and in obvious use. Therefore, publishing new blog content on a regular basis is another crucial strategy to help improve your site’s SEO. Keywords – Research keywords using Google Keyword Planner to help you find popular and relevant phrases for your articles. By using appropriate keywords within your text, you will help your articles appear in searches and rank for related content. Title – Use your main keyword in a post’s title. This will again increase the chances of your posts ranking in searches for similar terms. Subheadings – Break up text with subheadings and paragraphs. This will enable readers to quickly skim down the page, taking in the main points without having to actually read every sentence. Images – Eye-catching images that back up the main arguments of the article, and help break up the text, can also help a post connect with its readers. This will help keep visitors on your site for longer and encourage them to read further posts – such actions are looked on favorably by Google. Internal Links – Link to other articles and pages of your site to help both your readers and Google bots access your content. Calls-to-Action – Adding calls-to-action within your articles will encourage visitors to stay on your site and continue to read further articles. This engagement between content and readers will help boost your content in the search engines. XML Sitemaps – Add advanced XML Sitemaps functionality to your site with a push of a button. Breadcrumbs – Simply add a piece of code and then take full control over your site’s breadcrumbs. Search Engine Snippets – Use Yoast SEO’s title and meta description templating to create consistent and rankable snippets for the search engines. Yoast also offers a number of premium plugins to help with more specialized areas of SEO. Plugins include Local SEO, Video SEO, News SEO, and WooCommerce SEO. Contextual Related Posts – Display a related posts widget to the bottom of your blog articles to encourage visitors to stay on your website. Disqus Comment System – Add an advanced commenting system to your website, encouraging visitors to comment and discuss what they have read on your site. Monarch Social Sharing Buttons – Get your content shared on social media by adding social sharing buttons to your posts. Not only will this help your articles reach a wider audience, but it will also drive traffic to your website. These plugins will all create audience interaction on your website, which in turn will help your site to rank. It is always important to know how your audience is behaving on your website, as metrics like high bounce rates can really affect your site’s SEO. To find out more about this subject, as well as how to install Google Analytics to track your audience and site’s performance, check out our article How to Lower Bounce Rates on Your WordPress Blog. As you can see, there is much that can be done to improve SEO for your WordPress website. By implementing the strategies mentioned in this article, consistently producing high-quality content, and tracking your site’s performance using Google Analytics, you should start to see an improvement in your site’s SEO. This, in turn, should lead to an increase in traffic and ultimately a drive in leads, sales, and conversions against your goals.